We inspect hundreds of roofs each year to determine if the metal roof requires replacement. Metal roof replacement - below is an old metal roof, the metal roof was starting to rust and had leaks through out the building. The insulation had been damaged and was hanging in many areas. The roof had been coated two times before. We installed a new metal roof with new insulation. The new insulation actually made the building smell a lot better. There is a lot of mold growing in old wet insulation. We also installed all new EPDM rubber boots for all of the vents coming out of the roof. Also see our renovation page for more pictures of roof replacements. Below, an old metal warehouse before a metal roof replacement. When replacing a metal roof one of the many benefits is that the insulation is typically replaced or. added during the project. Below, a replacement of the metal roof and walls allowed for new insulation during the metal roof replacement. Metal roof replacement before picture. This metal building was used for storage before. One of the other nice features of a metal roof replacement with new insulation is a new clean smell. Metal roof replacement after picture. We were almost finished with the replacement, the trim needs to be installed and the clean up is to be done, but you can see the difference. 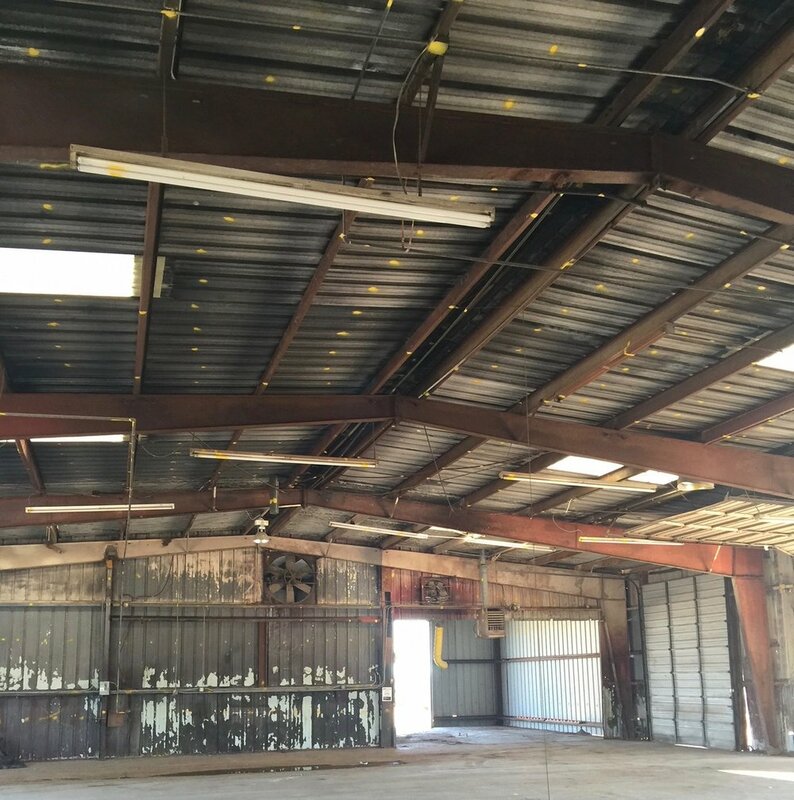 During the process we also cleared and painted the purlins, moved some walls, added some overhead doors. Whatever is on you todo list. We even had a new floor coating applied before we were finished. Metal roof replacement with new insulation installed, increasing R-value and providing a flat surface for the metal roof panel to be installed over the shingled roof. Installing the ridge cap on this new metal roof replacement project. Closures at the eave of this metal roof keep the water from coming in under the metal roof panels. Foam closures that conform with the panel profile are added at the ridge cap and at the eave. These keep birds, small animals and insects out, in addition to water. 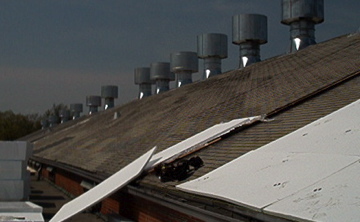 On the below left a walk path is visible, this allows for service staff to safely walk on the roof and to protect the roof against foot traffic damage. This completed metal roof installed over shingles should last 40 years. There are many types of metal roof profiles to choose from; standing seam, screw down pbr panel, U panel, and many others. New metal roof after it was replaced. Metal Roof Contractor. Above, the roof was replaced on this tennis court.